Buy 10 Sessions at $15, that is 66% off of the normail rate for this package! 10 Sessions of 1-on-1 Training! You can do this as couples training as well when you each have a package. Limit 1 package per person. With all programs you are eligible for the 6 pound guarantee, but you must act now before it expires! Get together with a friend or join a current group. Slots are limited so if you aren't sure then contact me sooner then later! Please enter your contact info below to join our email list so that you can be informed of future deals! I am so confident in this program that as long as you follow it you will lose weight I *guarantee 6 pounds lost in your 9 sessions or I will keep training you until you do! 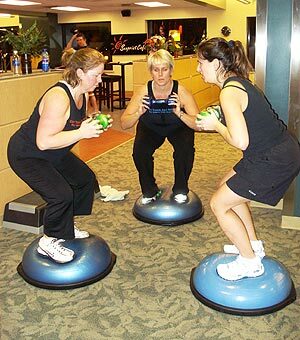 Just click on the ladies exercising to pay securely through PayPal and take advantage of the program! What in the heck are you waiting for, a better offer? Do you have questions or concerns? Send me a note right now! You must have substantially more than60 pounds to lose. It is well know that the last few pounds are the hardest to lose and may take substantially more time to lose than the first pounds.